Happy Harriet Carter Wednesday everybody! Harriet really came though again this week by covering the church, stupid criminals, and your common pervert peeping-Tom. It’s almost like the Harriet Carter crapalog catches fire as soon as you open it. Let’s go! Thanks Harriet for spreading your filthy treats to the public. Uh, yeah. Not so much. Who has that hard of a time locating street signs that you need this night vision tool? 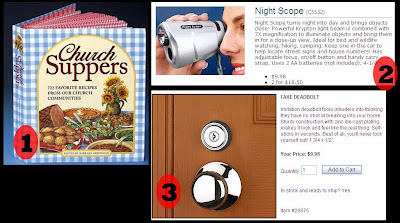 It should say, “keep one in your car so that when you’re hiding in a tree and peeping through your neighbors window you can easily see inside even at night!” Harriet Carter, you’re a filthy pervert and should be ashamed of yourself. I’ll take two.